Office tables and desks by USM Haller, Vitra, THONET and more. Discover our range of different tables in many sizes, materials and colors. Whether for the office, meeting rooms or the home office, we have desks that are optimally configurable for your circumstances. From the classic secretary to the large workstation, we supply office desks for every requirement. Our selection offers high quality and sustainable products from reputable manufacturers such as USM Haller, Vitra, Thonet and more. Classic design tables and modern office desk solutions add practical and visual value to your work environment. 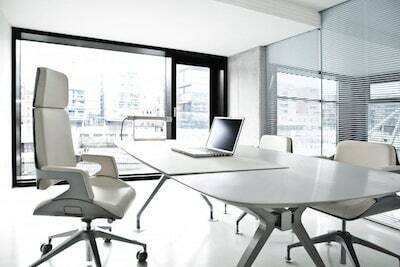 As an expert in the field of office and home furnishings, we are happy to advise you on your new desk and implement individually tailored concepts. Contact us. USM Haller table in USM colors, various sizes, 14 different colors. High quality USM furniture at the pro office online shop. 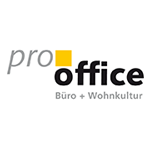 Sustainable products for office and home. USM Haller Table T59 / T69 with Quickship. Pure white, pearl gray or black. With chrome frame. Thonet S 285/1 desk - Benchtop: 108 x 72 cm, Top thickness: 2,5 cm, Frame: tubular steel, 25 x 2 mm, B 164cm x H 73 cm x T 43 cm, The desk can be set up inversely. USM Haller wooden table. Different sizes from 75x75 to 250x100 cm. Available with seven different wood surfaces. A-Table by Vitra is one of the items of purist furniture which made Maarten Van Severen famous and has become his trademark. Order now in the pro office online shop. The Home Desk Vitra (George Nelson, 1958): As graceful as it is decorative. Order now in the pro office online shop. The Thonet tubular steel desk S 285 is a successful example of the Bauhaus' programmatic claim of combining art and technology into a formal unit. The beautiful S 1200 from Thonet is a perfect match for your working space. It provides a unique working atmosphere and also fits in small places. Get yours here. USM Haller desk with drawer. Desk with extra storage space. First-class workmanship and materials. Order now online.